Is the style currently on trend? Or is it timeless and something that will last the test of time? Will you wear it enough for best cost per wear? Is the quality of the dress worth the price? Is the dress versatile? Can it be worn or accessorized in multiple ways? Again on versatility, is this a dress that you would be happy wearing to work / going shopping in / wearing around the grandparents / etc etc? It is easier said than done to find a dress that encompasses all of the above. For instance, I wouldn't exactly wear a long ballgown for a grocery shop, or wear a short body con dress in the presence of my grandparents (I learnt the latter the hard way with many a disapproving look and hearing the word 'pelmet' more times than I cared to. NEVER AGAIN). But I have done it. I have found the ultimate all-rounder dress. And it is a thing of beauty. 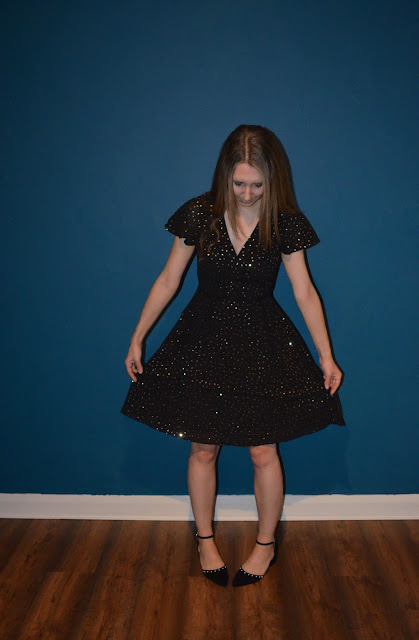 Tea dress meets skater dress in style, with beautiful floaty angel sleeves and gold polka dots - this is a timeless dress that I will treasure for years to come. With an element of glitz coming from the gold polka dots, but not so much so that it is designated to party attire only thanks to the every day feel and cut to the dress. This is a LBD with a difference. The perfect length, I would happily wear this when out shopping with the girls, for 9-5 in the office and for drinks after work. I also adore how versatile it is and how it can be worn in different ways. 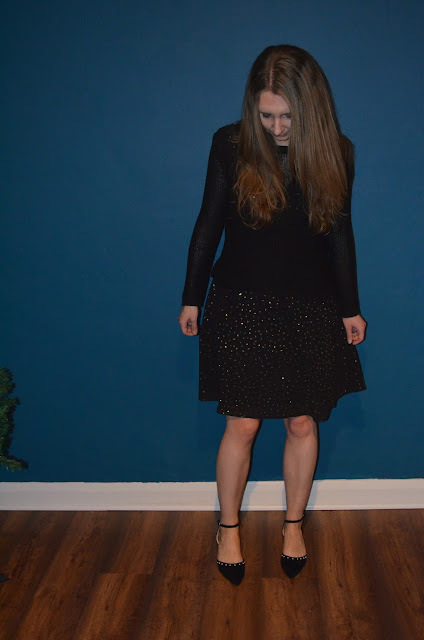 Admittedly this method doesn't work on all dresses, but on this sparkly number it did. Wearing it backwards adds the flexibility of an adjustable neckline thanks to the zip. How low dare you go? I love lower necklines, but I did find that this dress looked great zipped higher too. Wearing it backwards gave it more of a shirt dress feel. Appreciate the dress for what it is. It was an easy ask with this dress - just look at those pretty angel sleeves! 3. Is it skirt? Is it a dress? Just because something is labelled as a dress, doesn't mean you have to wear it as a dress. I like mixing up my dresses by wearing them as skirts to give them a new lease of life. At this time of the year, I love wearing cosy knitwear on top - it's a great way of dressing down a dressier outfit. But blazers and cardigans work equally well. Already chosen for my Christmas day outfit, it fits like a glove, creates a great silhouette, and has just the right amount of sparkle without being too over the top. It's also nice and floaty so I can eat all the turkey and all the cheese, and the skater style skirt will skim over any lumps and bumps. Which is a win in my eyes. It's never too late to pick up a dress for party season and New Years. There is an amazing range of party dresses on the Simply Be website and I've already been eyeing up this dreamy bardot dress with metallic pleated skirt. Have you found your perfect sparkly party dress yet? 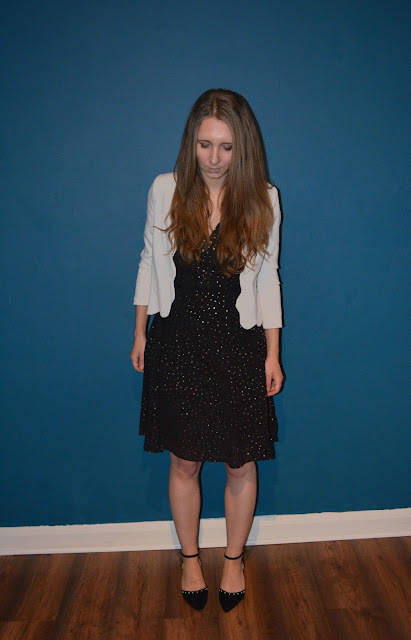 * Dress very kindly provided by Simply Be, but love of sparkly, versatile dresses all my own!